What’s the secret to Amazon’s booming success? How do they manage over 3 billion products across 11 marketplaces and still have potential for growth? In 2017 alone, Amazon generated more than $177 billion in sales, and year over year they see a growth rate of at least 27%. When it comes down to it, it’s their fulfillment and inventory management strategy that sets them ahead of retail and e-commerce competitors. Not only have they mastered the art of inventory management, but they drive innovative practices to the industry too. From warehouse robotics and drones, to cashier-free shops taking advantage of cameras and sensors, these are the forces that push their growth and competitive edge. 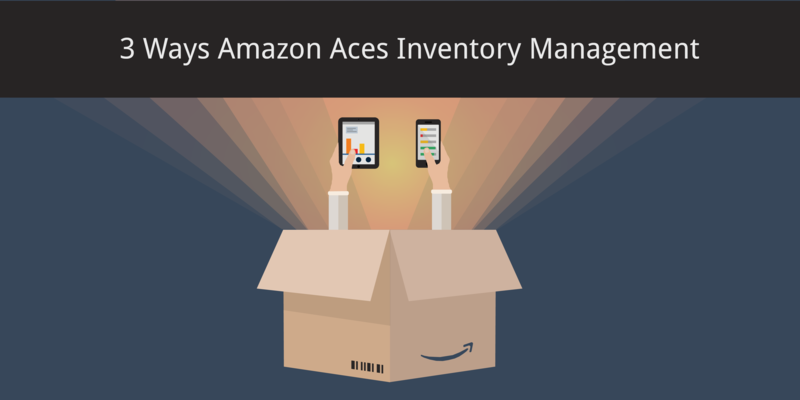 In this blog post, we will examine 3 inventory management strategies that Amazon uses and how it can apply to your business. Although Amazon may have the resources to operate at such a capacity, there are still valuable lessons we can take from their operations. Lean inventory management is the practice of having just enough inventory to keep up with demand, but not so much that it is harmful to your business. But it’s not just balancing the level of stock you have, transforming your operations to be more lean requires other changes too. Following the lean operations model, one of the earliest changes that Amazon made was revamping their warehouses to make it easier for workers to locate, sort, and ship customer orders. They also use inventory management software to estimate customer demand and reduce stock-outs. In addition to improving customer experience, this cut their operating costs by 17% in 2002. Now, they continue to refine their supply chain for ways to reduce costs, boost their bottom line, and maximize efficiency. For instance, they have advanced software to predict demand in different regions. They also optimize their warehouse layout so items that are commonly purchased together are located in proximity. Their largest warehouse facility covers 1,264,200 square feet – so you can imagine the time it would take to pick and pack those orders. They partner with different companies that handle inventory and shipping as well, and this leads into our next point. Vendor Managed Inventory (VMI) means exactly as it sounds – suppliers restock items every time a product hits its reorder point. With millions of SKUs to manage, Amazon doesn’t need to manually place purchase orders when stock runs low. This method of inventory management allows suppliers to take care of their own products within a retailer or e-tailer’s inventory. Over half of the products listed on Amazon are sold by third party sellers. Third party vendors send their inventory to Amazon’s warehouses and the company takes care of the rest. From picking and packing, processing customer payments, to sending it off for shipping – this fulfillment strategy has benefits for all parties. Amazon simply provides the channel for vendors to sell their products. So how can adopting VMI help your business increase visibility and improve efficiency? Vendors can track inventory levels using min, max, and reorder points. They can also better understand their performance through real-time reports and analytics. Within a robust inventory management system, you can be equipped with consignment capabilities like order generation, billing, unit of measure conversion, and much more. Vendor Managed Inventory improves delivery times, creates intelligent workflow, and increases demand forecast accuracy. When you think Amazon, an image of a massive warehouse probably comes to mind. To manage all that stock, they need to optimize all areas of their warehouse operations. This is where warehouse management and third party logistics (3PL) come in. In terms of the warehouse, Amazon automates many of their processes which leads to task efficiencies at every level. How can you do the same? The features within a warehouse management system allow for paperless picking and packing, shipping integrations, return material authorization (RMA), and more. You can create custom labels and use scanners to turn lengthy manual processes into one-step tasks. This maximizes worker productivity and ensures streamlined operations. Amazon is quickly becoming a 3PL provider itself. They provide a means for vendors to advertise and sell their products to customers, but also stores the items in its fulfillment centers, pick, pack, and ship them, and provide customer service like handling returns. As a business, having a 3PL provider can improve your operations in many ways. You can save time, money, and warehouse space by partnering with a 3PL that has an existing network and infrastructure. You can read more about how to select the right 3PL partner here. Amazon is dominating the industry, and through examining their fulfillment and inventory management strategy, it’s easy to see how they’re succeeding in so many ways. Lean operations should be a model for every business because you reduce unnecessary expenses and re-allocate resources to areas with a higher ROI. VMI should be considered to save on carrying costs and improve overall efficiency of order fulfillment. Finally, adopting a warehouse management system that suits your business can significantly transform manual tasks and increase visibility across entire operations. Partnering with a 3PL provider can further simplify your distribution practices and be scalable with the growth of your business. Want to learn more about Inventory Management? See How Clear Spider Can Help. Schedule a Demo today!